I had never heard of that grave Russell. I guess that it has nothing to do with Farley Mowatt´s cairn of Baker Lake. I can´t measure distances now but I think Baker Lake is farther north from Fort Churchill than the location of that grave. In any case, if both findings actually belonged to the Franklin expedition, it could indicate that a retreating party could have followed a straight line from Back´s river mouth to Fort Churchill. Interesting article, esp. when one considers the author was alive so recently! Just wondering about carrying cannon shot with them......one would think bare minimum of weight would be carried. ?The other thing is, that if someone made the grave and inscribed it, who did that and isn't it a shame no local stories exist about this? If this was a Franklin expedition grave, it sure makes their epic journey all the more incredible. The grave sounds very much like the one found by a fur trapper on the Barrens, near the tree line, in the 1940s. Farley Mowat wrote a book about it, "The Curse of the Viking Grave." Mowat told me he based it on a story he was told by a fur trapper, whose name I won't disclose just yet. I have always wanted to go and look for it. I have a hand-drawn map that the trapper made and sent to the Canadian government. Although I have examined air and satellite photos of the area, I have not yet found any sign of it near the x that is marked on the map. But then, as Indiana Jones stated, "X never, ever marks the spot". Fritz Oftedal, a trapper from that era, whom I met in Churchill in the 1980s, told me that the first trapper was very serious about going back to find it and chartered an aircraft to go look. Fritz figured that his friend, who could find his way by dog team or canoe to Churchill and back, seemed to have been lost from the moment he took off. As the crow flies, it is 250 miles from Churchill! It sounds to me like Pease heard a story of this structure and invented his explorations to fit it. I know that Farley Mowat heard the story. So is this related to the Mowat story about the box? According to Woodman that was later: “In 1948 a very ancient cairn, not of normal Eskimo construction, and containing fragments of a hardwood box with dove-tailed corners, was found by myself [Farley Mowat] and a companion at Angikuni Lake on the Kazan River in central Keewatin, near a famous junction where the Eskimo trade routes between Churchill and the Arctic coasts converge. Considerable research has failed to identify the builder of this cairn." This certainly sounds like something that ought to be followed up on! It sounds like the box that Mowat says he found under a cairn was part of the story. The grave was quite different. I passed on to Mowat what I had learned from the Archives and he was surprised by details he hadn't known, that there were a lot of logs in the construction, for example. He had envisioned it as a stone structure, which features in two of his books, Lost on the Barrens and The Curse of the Viking Grave. Mowat met the trapper in Churchill and learned about it from him, he said. However, it is one of those stories that might have made it into a Canadian newspaper. In 1935, Mowat wrote a column for the Saskatoon Star Phoenix. It would be of interest if this story was picked up by that paper that year. in 1899, Rev. Lofthouse traveled on the Tha-Anne River, which is mentioned in the article as where the box was found. He wrote an article about his travels in the Geographical Journal, to which I have no access as I am not associated with a learned society. Tina Adcock's paper does not reference the statement that Pease didn't go farther north than Winnipeg. Maybe he just told the government that because they wouldn't give him a permit. According to my notes on the correspondence in the file, Pease did make it to Churchill, but apparently not to the Northwest Territories. He apparently made quite a poor impression among some people both in Winnipeg and Churchill (in addition to the Northwest Territories officials in Ottawa). He also allegedly stole a Franklin-related manuscript of some kind from an elderly woman in Winnipeg and never returned it. (I do recall seeing this charge crop up again in a different contemporary file in RG 85, which might have been related to Edward Shackleton.) Unfortunately, my notes merely summarize this portion of the file, so I can't tell you the sources for this information. However, it's all on record in Ottawa if you'd ever like to look it up! According to my notes on this file, Pease also wrote to the Northwest Territories officials again with a new, suggested expedition to take place in 1937. Superintendent Caulkin of the RCMP termed him "a most undesirable type to be granted permits" for scientific exploration. So, did Pease make it to the Northwest Territories on this expedition? It's possible, although the file seems to suggest not. Could he have made it there on a subsequent, perhaps undocumented expedition? Again, it's possible. As I note in my article, travellers could and did slip beneath the administration's radar and find their own way to the Territories without permission. Hi Tina, and thanks so much for your comments here! It may well be that Pease's story was exaggerated in some ways, but he did at least make it north of Churchill -- I checked with the Manitoba Museum and they tell me they have a manuscript letter written by Bernice McIvor (wife of the famous trapper Angus) describing how he accompanied Pease on a northern sledge journey. It's not at all clear that the letter corroborates Pease's claims as to what was found, but it appears that, having been denied a research permit, he went anyway. That said, I'd love to know the additional info from LAC -- I did see the fond there, but it looked as though it was restricted in some way. The bad reputation that Pease apparently gained is curious -- McIvor was not one to truck with tenderfeet; he was also a very erudite fellow who wrote a number of articles for The Beaver about wolves and wolverines. An enlightening article was printed in the Aberdeen Press and Journal, 5 August 1937. Pease was hoping to find the famous "cemented vaults" and had a map showing its location. I have to wonder if it was the Baynes map (Jamme). He said that Rasmussen had given him a map he'd found in a cairn. If it was a dirty trick being played on a naive searcher, Rasmussen couldn't call it off when Pease got serious, as he had died a few years earlier. Meanwhile, in Manitoba, people were wondering why Pease was planning to take three years for this search, travelling over land and sea, when he could fly there, as Burwash did in 1925-26. Interesting reading but so typical of "Franklin" related information that it is never straightforward! Always more questions, did Pease actually go there, was it the grave mentioned by Mowat etc. I hope the mystery surrounding this grave is more reality than myth! Pease's prediction about log books being found near Victory Point got me thinking that if they had been there, with appropriate cairns, are there "ruins" of these things? The crew would have left markers, then in theory, torn them down to retrieve things once they re-manned the ships. Franklin info is never a clear cut enterprise! I have been reading the MacIver's book. The first part describes life and travel on the barrens, as a trapper. The large "grub box" made of wood to contain food and many other things, was an important item of every trapper's kit. There were also smaller wooden boxes. So the box found by Mowat may not have been a "sea chest" after all. I came across Pease's memoir today - 'To the Ends of the Earth' (1935) in which he devotes a few short chapters to his Arctic experiences of 1934. Although he comes across as a bit of a fantasist, there are some interesting snippets. 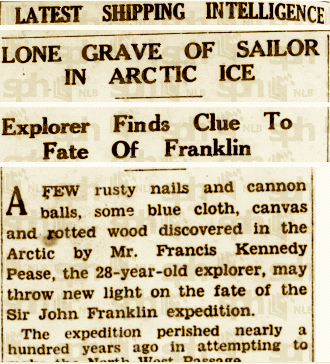 He mentions a tip-off from Rasmussen and was inspired to go to the Arctic as his theory was that after the Franklin ships broke up, John Franklin (deceased of course), decided to divide the crews into three sections and that 'at a given base there must be a full explanation of the tragedy, written up in log books or diaries'. For his expedition, he reached Churchill in September 1934 but missed a schooner heading north by five hours. He had to abandon a canoe journey north (!) due to bad weather. By November he had assembled a dog team at Churchill, although this was hard due to an outbreak of distemper, and he was not impressed by the quality of the dogs. His new plan was to travel by sledge across the ice. He travelled the 'Arctic bush' up the Churchill River (?) for a few weeks and on December 8th he found an old Cree gravesite some 64 miles north of Churchill. It was built in the Indian fashion, he says, 'a dozen sawn-down trees' making a capsule for the corpse, sealed up with sods of tussock. On the end of one of the trees was an inscription in Cree, which he later translated: 'White Man Buried Here 1852'. 'Here was a relic that surely showed me that at least one of Franklin's party must have practically bordered on civilisation, as the date of this burial concurs with the date when that ill-fated expedition met its fate'. Pease returned to Churchill on December 11th. On December 26th he made three abortive attempts to reach Chesterfield Inlet in the company of two Inuit, Kubloo and Enlouty, but the sledge load was too heavy. Admitting defeat in his quest, Pease was certain Franklin's body would be found on Montreal Island, because Kubloo told him the story of his great-grandfather who searched for Franklin and remembered 'red-bearded men' seen near Chesterfield Inlet carrying a chest containing 'closely written papers'. Pease's book is an entertaining read and has plenty of interesting photos, but it is clear he was an amateur and out of his depth, and the story of the Cree/Franklin grave so close to Churchill sounds dubious.